VANKLEEK HILL, ON – Beau’s All Natural Brewing has announced the return of its autumn seasonal variation on The Tom Green Beer Milk Stout, following the summer run of Tom Green Summer Stout. Tom Green Cherry Milk Stout pours black-brown with garnet highlights and an off-white head. The aroma offers dark malt notes reminiscent of mochaccino, coupled with sweet, fruity cherry inflections. The flavour imparts dark chocolate and dark roast coffee, offset by sweet dessert-like cherry intonations. The finish echoes with lingering dark malt and cherries. 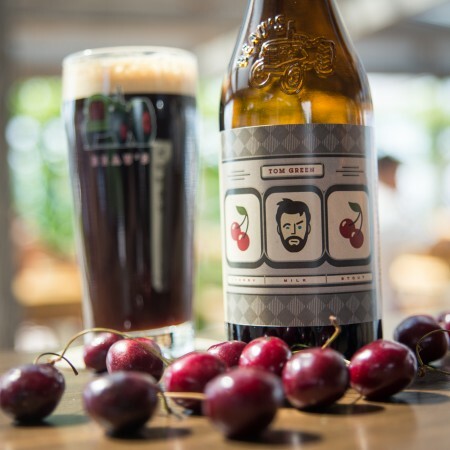 Tom Green Cherry Milk Stout will be available soon at the Beau’s retail store and BYBO delivery service, and select beer retail locations in Ontario and Quebec. It will also be released in British Columbia, Alberta, and Manitoba in limited quantities.